The other day I received a phone call from my good friend Dominique Corby, the Chef/Manager of Michelin-starred 6eme Sens in Tokyo. He told me that the French/German ARTE TV Channel was coming to Shizuoka City on September 12TH~13th to make a long report on green tea (Shizuoka produces 45% of all green tea in Japan), wasabi (Shizuoka Produces 80% of all wasabi in Japan) and the fishing industry in our Prefecture (they will visit the Fishing Harbour of Yaizu City)! He wished to enroll my help to “prepare the ground” for the TV crew as I was not only living in Shizuoka City, but knew my wasabi well! He didn’t have to ask twice! So on Thursday and Friday 12th and 13th, a third Musketeer, Stephane Danton of Ocharaka, a French specialist of green tea in Kanagawa Prefecture who exports green tea from Kawane Honcho in Shizuoka, joined us in a rented car and we left on a grand mission! 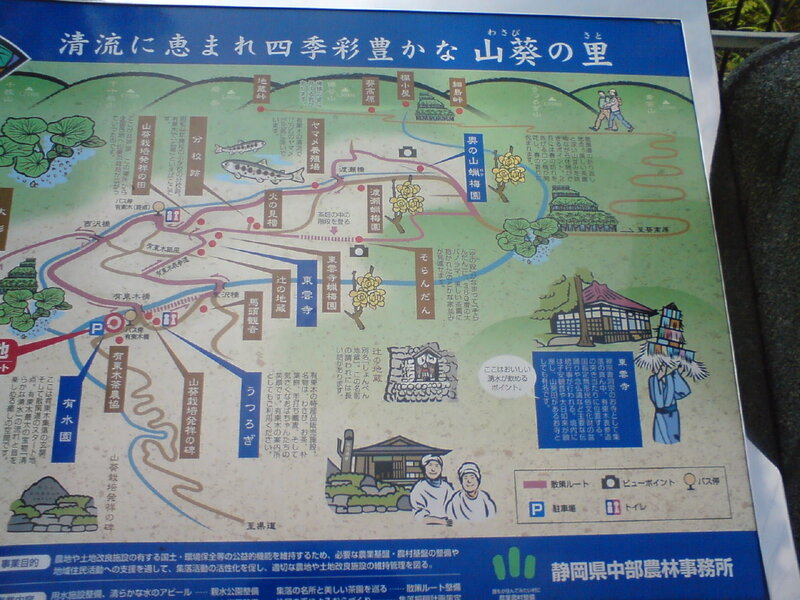 Utogi is also the starting point of some great treks! We did spend the whole Thursday following Stephane in tea growing farming homes and communities as the rain just made it impossible to visit the wasabi fields in altitude! So we left early in the morning on Friday from Shizuoka City in blistering heat. The ride is not that hard, 18 km along the Abe River and 3 more km up in altitude, what with the beautiful vistas between high steep forested mountains. We reached Utogi at around 11:00 a.am. where Mr. Yuma Mochizuki was already waiting for us. 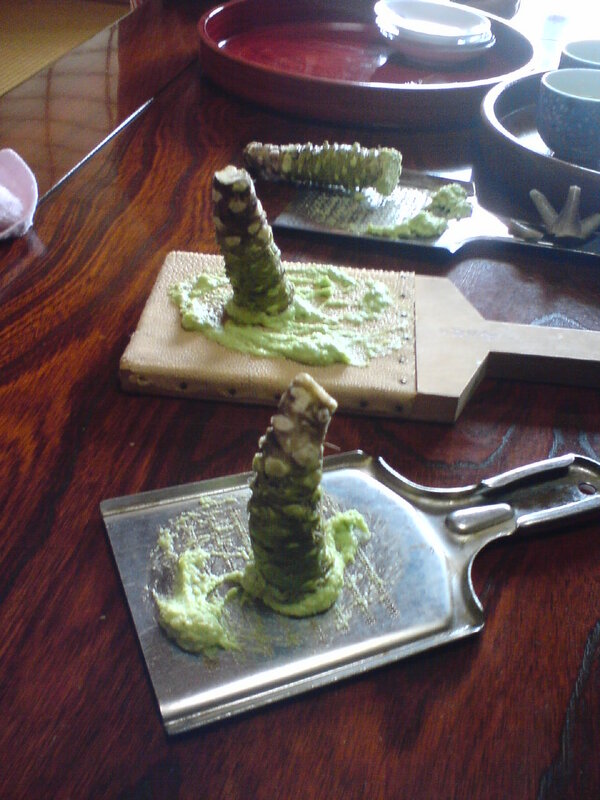 One of Mr. Yuma Mochizuki’ wasabi fields. 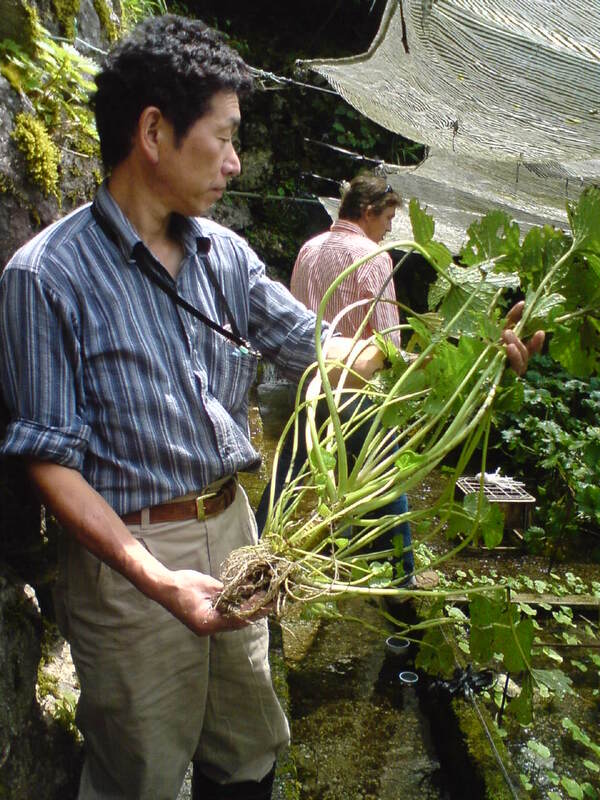 Mr. Yuma Mochizuki is the 10th generation of a celebrated wasabi growing family. 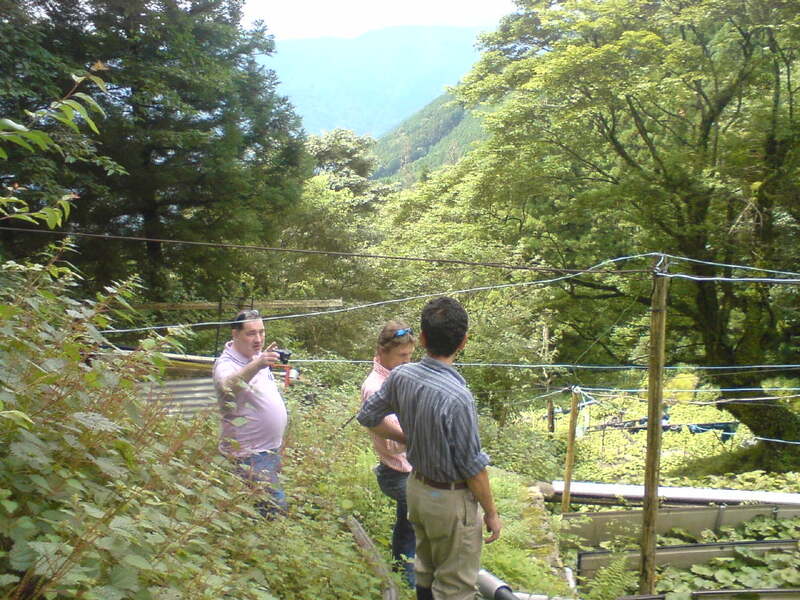 He presently owns 5 fields dispersed on in the Utogi Mountains, and is trying to buy more land in Fujinomiya City as the demand is growing and that there is simply no space left in Utogi! 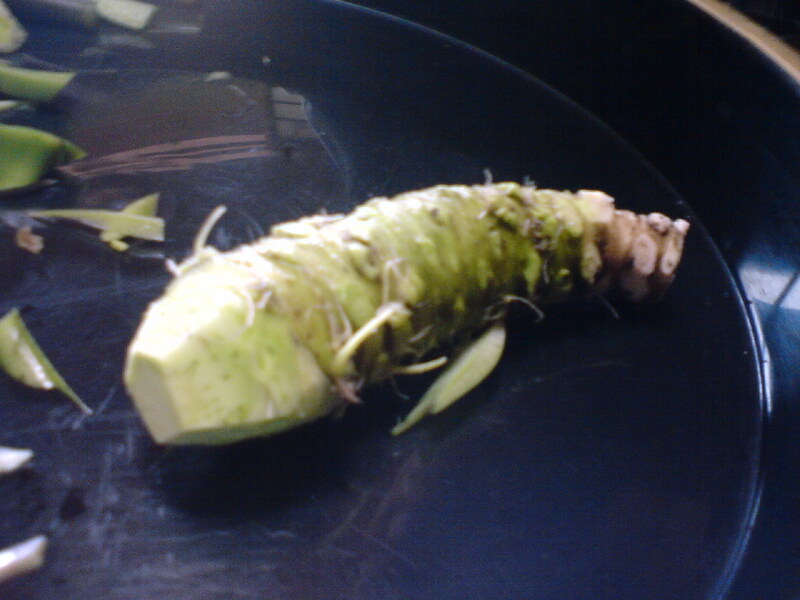 Wasabi grows in the wild and has been consumed as a vegetable for eons. It is only in the beginning of the 17th Century that a farmer in Utogi succeeded in growing the root that is so appreciated in the world. Roots of a small size will develop in the wild after 2 or 3 years, but they are too sour and “green” to be consumed at all. Although its cultivation is purely organic/macrobiotic it does need the help of a human hand. Mr. Mochizuki first took us to his highest field at almost 1,000 metres (well over 300 feet) to an almost inaccessible locale among trees, steep slopes and up impossibly narrow and slippery “stairs”. But it was certainly worth it, although the TV crew will ot have to climb so high. He then took us (all the time by car as walking was not much of an option what with the heat and the distance between fields) to the field that would appear on TV. The whole field is covered with a black mesh net to protect it from too much exposure to the sun. These nets are streched over the field only when it is directly under the path of the sun. Some fields aren’t. 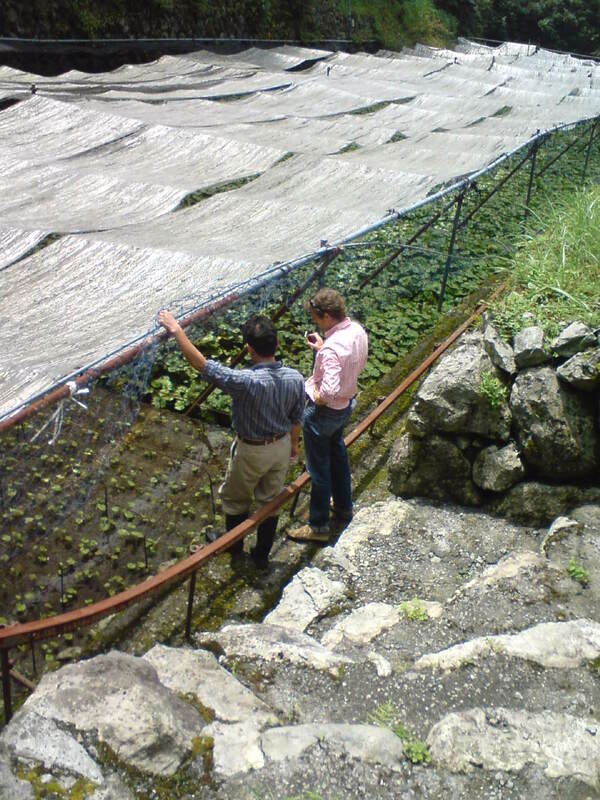 But all fields have to be protected with suplementary solid side nets to keep wild monkeys and deer away as they would leave nothing of the stems and leaves! 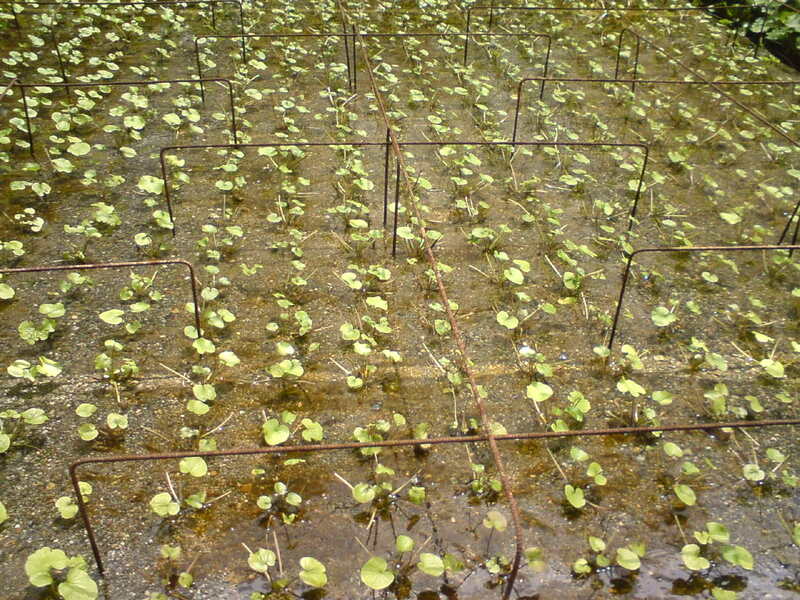 Wasabi seedlings have to be regularly replanted every one or two years depending upon the variety. There are axtually more than 100 varieties of them. Mr. Mochizuki grows ten of them. The seedlings above had been replanted only one month ago. 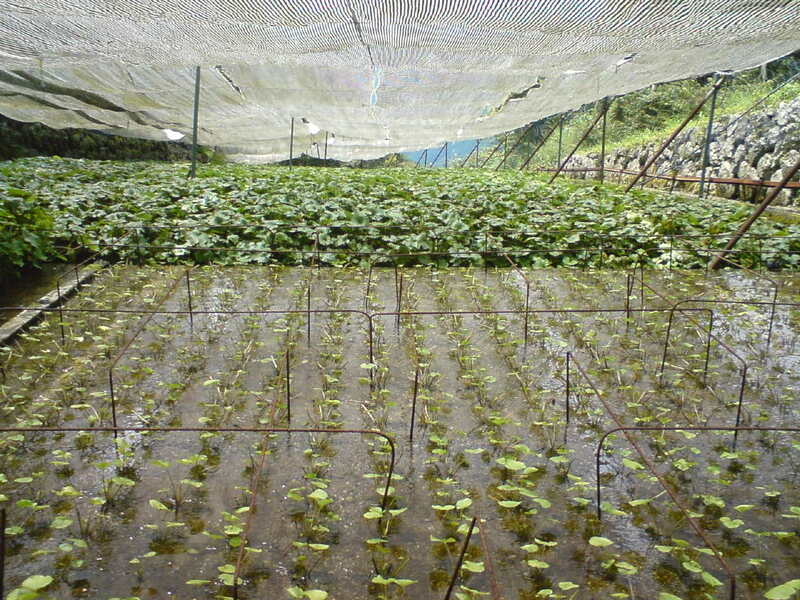 Here is a “view” (from under the nets) of the upper part of that particular field with about one-year old wasabi plants in the background. 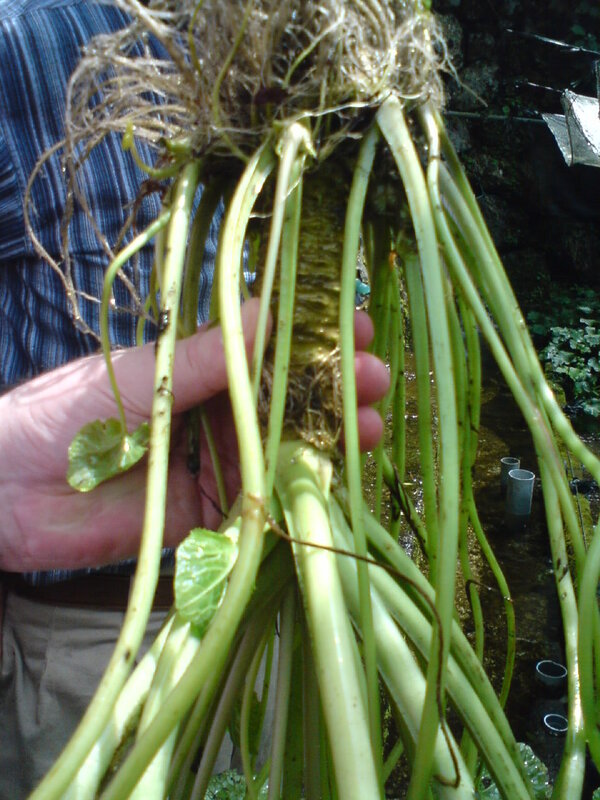 After 1 or 2 years the wasabi plant matures to almost one metre in height, root, stems and leaves included. 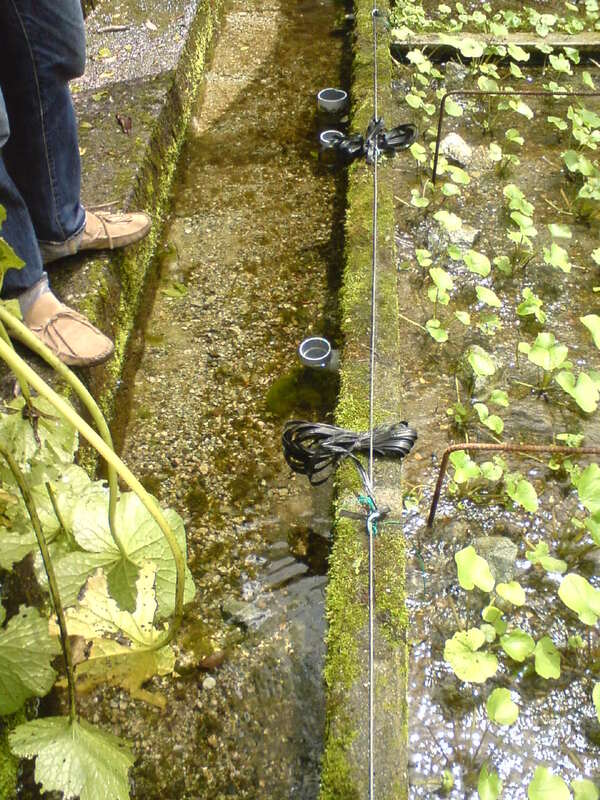 Subsidiary plants will grow from the bottom of the main large root. These will be cut out to be replanted. 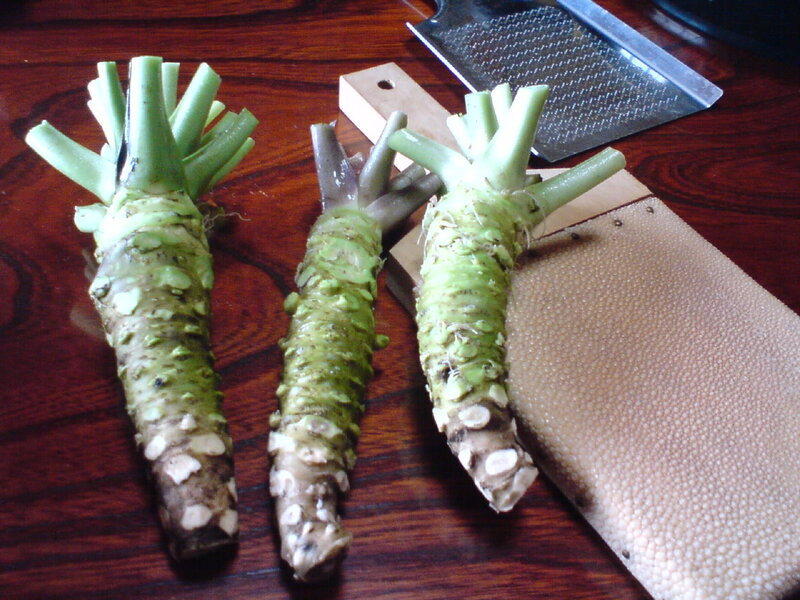 The large root will be harvested for the wasabi paste. 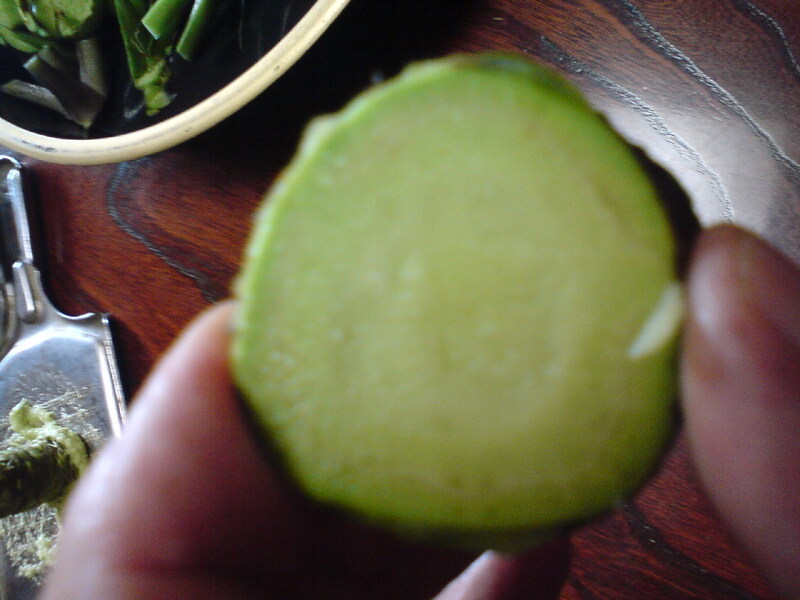 The stems will be pickled in Japanese sake white lees to become “Wasabi Tsuke”, a delicacy one can use to season his/her bowl of freshly steamed rice with or with fish and fish paste. The leaves can be pickled too, although they are eminently edible raw, steamed or cooked. Shizuoka people use them as “vessels” to taste miso paste! 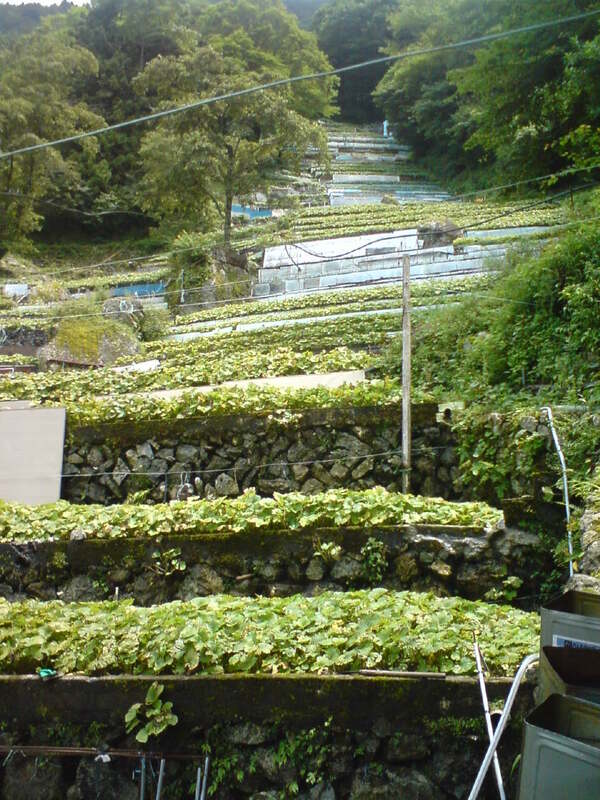 Only pure mountain water flowing at a constant temperature may be used in the culture of wasabi. Stagnant water is out of question. Moreover, and this is a little known fact, individual field sections and fields in general do not communicate with each other. Water come through pipes directly connected to mountain streams to bring water to each field section. It is then diverted to side funnels which prevent any water to go back into another field! True envirnomental and organic culture. Apart of the bed sand and water, nothing else goes into those fields. Full stop! 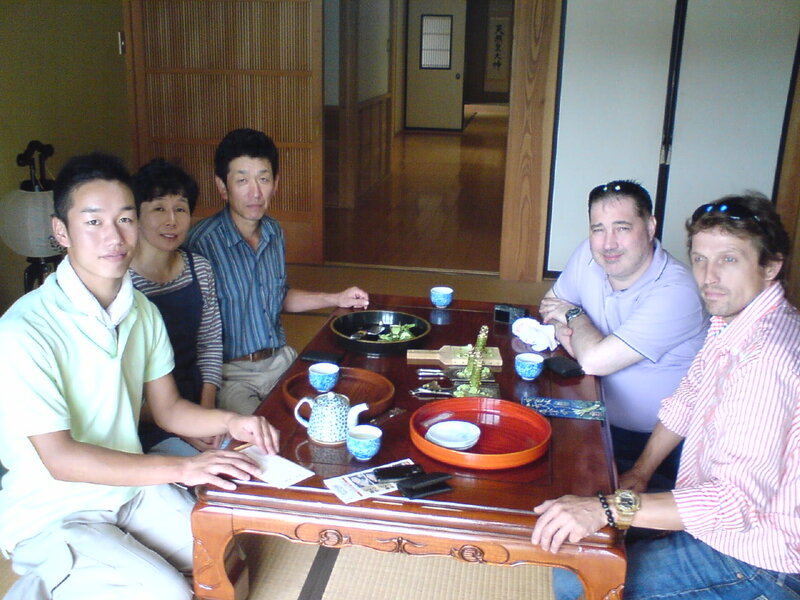 Although Mr. Mochizuki was very busy preparing the big Festival to be held on Saturday and Sunday with the whole coomunity, he kindly took the time to invite us to his enormous Japanese house (all stting on tatami there) to share tea and sample his wasabi crop. We had the pleasure to meet his very gentle spouse and the energetic 11th generation Yoshihiro Mochizuki望月義弘! The one in the middle with the dark stems! Now, where do you grate the stem from? The pointed end or the stem end? Well, this is according to priorities, but usually after chopping the stems away the root is first grated from the top as it will hotter as you come closer to its pointed extrememity. This way you can control the “heat” of the root (or mix the wholelater!). Have you ever seen the cross section of a healthy root? 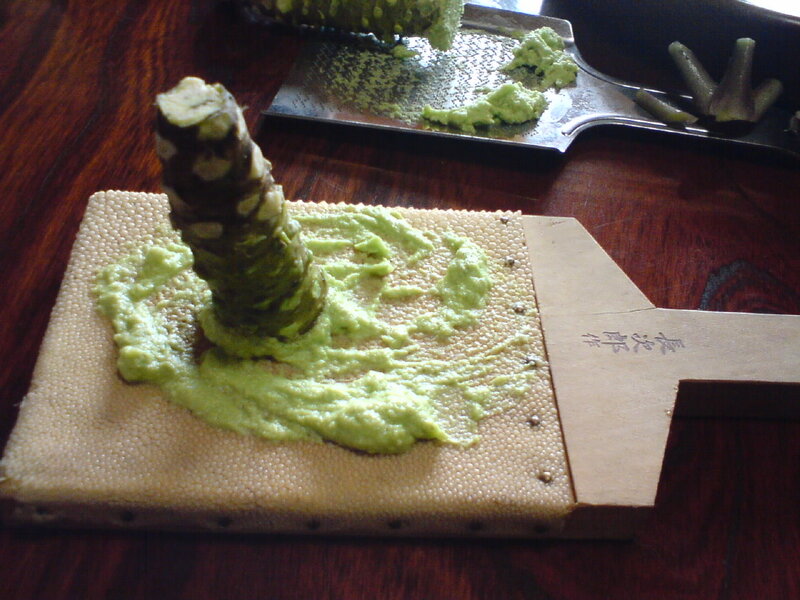 The traditional way to grate the wasabi root is on a wooden slat covered with shark skin. Mr. Mochizuki explained this is now done only for the sake of tradition. Sushi and soba chefs will grate (away for the clients’ eyes) on a new and very efficient metal grater (in the background). Look at that for extravagance! Mr. Mochizuki was indeed so generous in his demonstration. 100 varieties of wasabi! We never was able to see, buy or eat the root, the real stuff! Here im Germany I can only buy wasabi pouder with only 2% of real wasabi – the rest of the ingredients are mustrad, spirulina (for the coulor!) and tapioca starch. Isn’t the japanese agricultural culture just in its whole just amazing? I’m simply in love with your blog, vrai bonheur! Merci! If you have any questions on Japanese and Shizuoka gastronomy, I’ll be glad to oblige!